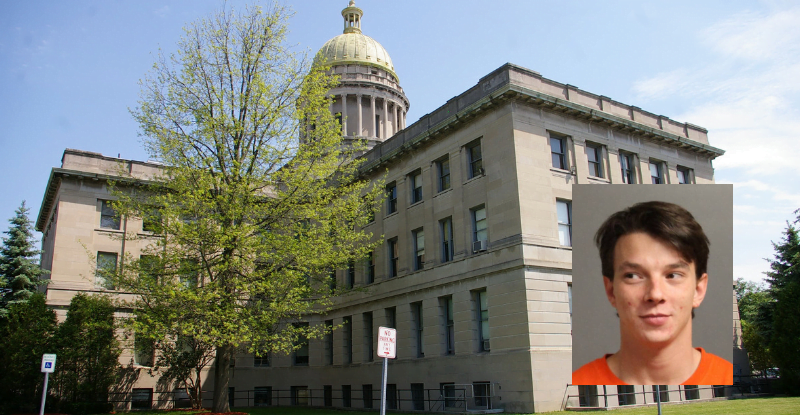 A Cortland County jury took just over two hours to return a guilty verdict in the trial of Dorian Bohn, who was convicted today of murdering his girlfriend’s two-year-old daughter. Bohn, 29, of McGraw was convicted of second-degree murder and first-degree manslaughter, felonies, as well as endangering the welfare of a child, a misdemeanor. He was found guilty of murdering Kassidy Dains, who died on April 19 of a depressed skull fracture after sustaining 50 injuries while in Bohn’s care. Hewes hugged and thanked District Attorney Patrick Perfetti as he left the courtroom. Perfetti said in a phone interview Monday evening he was happy Kassidy Dains received justice. Dains’ mother wept when the jury announced its guilty verdict. Several of Dains’ family members held hands as the jury entered, then gasped and cried when Bohn’s conviction was revealed. Bohn appeared stoic after the verdict reading, while members of his family appeared dejected. Two declined to comment, as did Public Defender Keith Dayton. Sheriff Mark Helms, whose office investigated the murder, said he was happy with the results of the trial. Bohn is scheduled to be sentenced at 10 a.m. March 28, Perfetti said. The maximum sentence Bohn can receive for second-degree murder is 25 years to life in prison, while the minimum is 15 years to life, he said. Hewes said after the trial she hopes Bohn is sentenced to the maximum the law allows. While Bohn was also convicted of first-degree manslaughter, which carries a maximum sentence of 25 years to life in prison as well, the sentences cannot be stacked on top of each other by law, Perfetti said. That means Bohn cannot be sentenced to a total of 50 years to life in prison. This is because both convictions are for a single homicide, Perfetti explained. Since endangering the welfare of a child is a misdemeanor, its sentence would also be rolled into the state prison sentence, he said. Dayton and Assistant District Attorney Elizabeth McGrath delivered closing arguments this morning and the jury started its deliberations after lunch. During her arguments, McGrath showed the jury the autopsy photos of Dains’ extensively bruised body again, called their attention to the dent in the wall at the height of the girl’s head with one of her hairs in it, pointed out the many contradictions in Bohn’s statements to police and played Bohn’s 911 call. In the call, Bohn waits a minute and 16 seconds to tell dispatchers the two-year-old isn’t breathing, McGrath told the jury. On the night of the girl’s death, members of the McGraw Fire Department, emergency medical responders, Cortland County Sheriff’s Office deputies traveled through a snowstorm to aid the toddler, while a County plow truck driver cleared the road for the ambulance and Cortland City Police officers cleared intersections of traffic. “They’re all working together to try to save Kassidy,” McGrath said, asking the jury to compare Bohn’s inaction for 90 minutes while the girl died. Dayton argued in his closing statements the injuries to Dains could have been caused by a fall from a bed, the police did not thoroughly enough investigate that possibility and Dains’ hair was on the wall because she lived, not because her head was struck against it. Dayton also questioned what motive Bohn could have for murdering Dains. McGrath argued Bohn’s motive was simply he wanted to be left alone and not bothered by an active two-year-old.